Guthrie Douglas manufactures a wide range of high-quality glass roof blinds and atrium blinds for a range of commercial applications. They provide superior temperature and light control whilst having minimal effect on the building’s aesthetic appeal. Why apply blinds to a glass roof or atrium? Glazed roofs can create a significant impact within a building’s interior. They are often gathering places such as lobbies, meeting rooms and other communal areas. This means that the control of heat and light is essential to their success. They are also seen as the centrepiece within a building’s interior so it is important that their aesthetic appeal is not comprised. 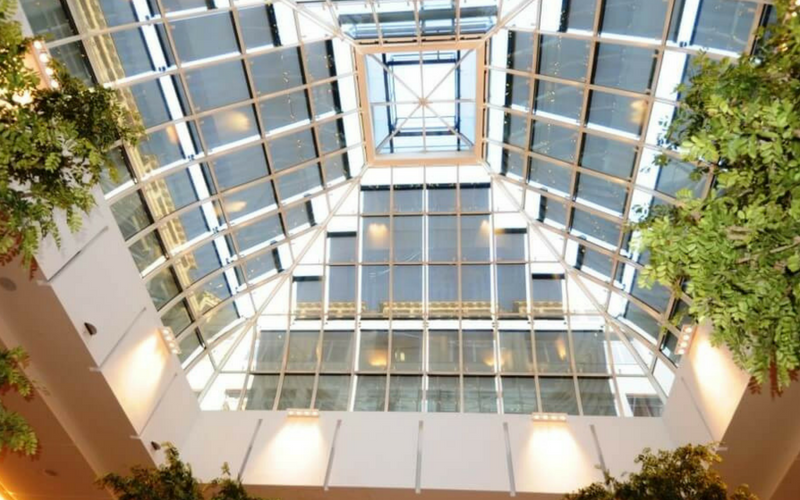 Applying blinds to a glass roof or atrium can create a striking visual effect whilst also making the interior’s temperature and solar gains manageable for the occupants. Shading with high-performance fabric enables the precise regulation and energy savings. This is done whilst also letting in the exact right amount of natural light, for the comfort of the building’s occupants. Automated tension systems can be installed to match a building’s structure either horizontally or at an angle. They also have the ability to cover up to 100m2 with a single shading system. Guthrie Douglas create blind systems tailored to your individual requirements. We do so by taking you through the entire design process from conception through to installation. Our glass roof blinds can be designed for a variety of configurations with unlimited colour finishes. We also provide a wide range of fabrics and controls that are available to suit any building design. To find out more about our ranges of glass roof blinds and atrium blinds, contact us at our head office today.